With a premium top on your AlphaBetter® Sit/Stand Desks, you can create that airy contemporary feel that makes modern classrooms so appealing. 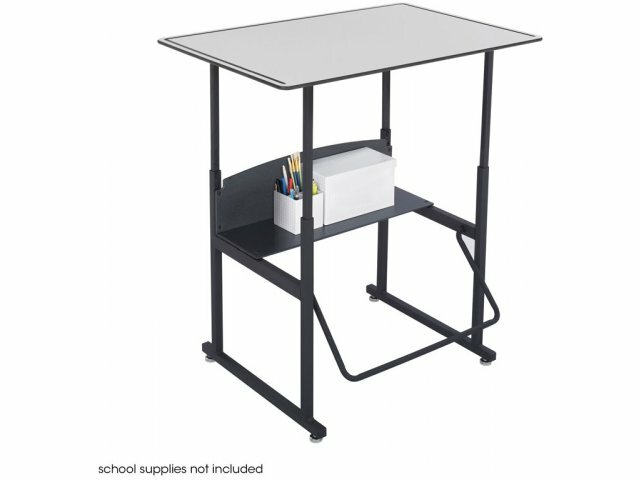 Students will swing through the school day with the AlphaBetter® Sit/Stand Desk. Tired of students fidgeting and moving around in class? This innovative school desk will teach kids a healthy lesson. A patented Swinging Pendulum Footrest Bar provides a non-disruptive outlet that helps students self-manage energy levels. While standing at their desks, they benefit from the continuous foot-swinging motion, which promotes health, focus, proper posture and multi-sensory learning. Sit/stand desks take learning to new heights. Standing helps students remain alert and engaged in lessons. Standing students will have a hard time falling asleep at their desks and can easily burn excess energy without ever leaving the classroom. 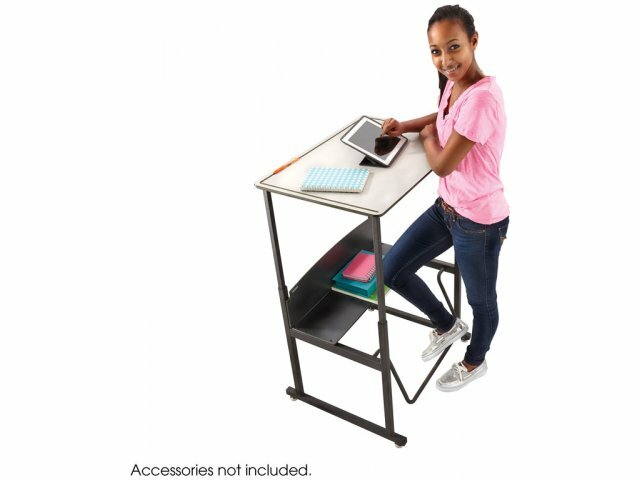 With a wide range of height adjustment, students of many ages can benefit from this ingenious alternative to the classic school desk. 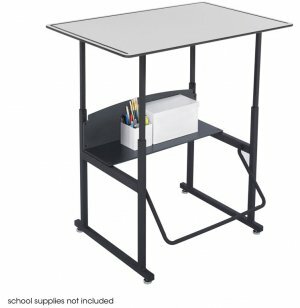 Your students will be moving to the school day beat while working at the AlphaBetter® Sit/Stand Desk. Over the past 40 years, Safco has become a major provider of organizational and comfort products for the workplace. With 2,200 premier products, Safco offers something for everyone - from universities and hospitals to preschools and offices. Super Durable: Premium Grey Phenolic work surface is fire-, chemical- and impact-resistant. Abundant Desktop: The large 36"x24" work surface provides plenty of room for papers, books, pencils and more. Active Learning: The patented Swinging Pendulum Footrest Bar integrates physical activity in the classroom, while encouraging noise-free, natural fidgeting. Healthy Support: Footrest provides stress relief for the lower back and helps to improve posture. Convenient Design: Pendulum bar easily flips for cleaning clearance. Standing Advantage: Standing in class promotes blood flow while keeping students alert and focused. Accessible Storage: Book shelf is great for keeping school supplies and personal items in easy reach. 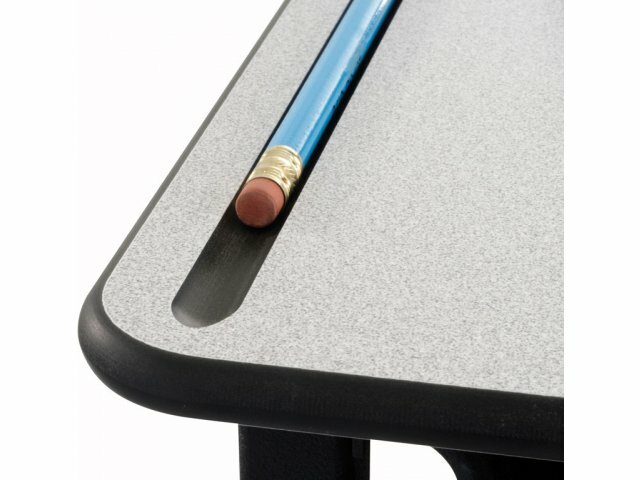 Perfect Fit: Height adjusts from 26"-42" to fit students in grades 3 to 12. 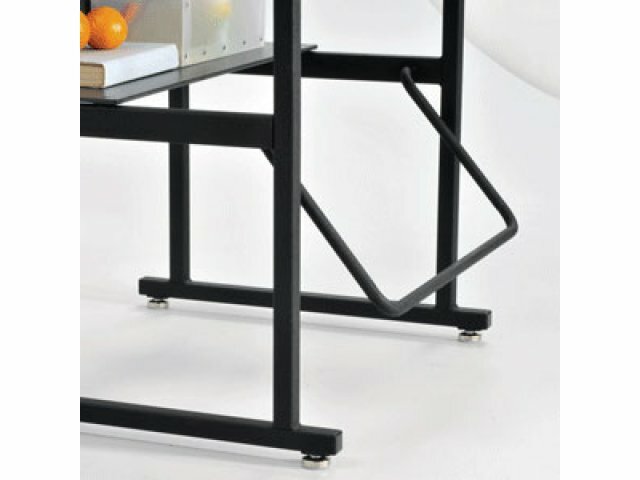 Sturdy Frame: Supported by 1" square, powder-coated, 16-gauge welded-steel frame.